I love chocolate chips cookies. Who doesn’t love them? To me, they are one of the best comfort foods, especially if they are coming right out of the oven. Since most people love them, chocolate chip cookies are often my “go to” dessert. I make them when I bring people a meal. I bake them when my husband has a bunch of guys over for a fantasy football draft or some. I take them to gatherings. And never have I had any leftovers to bring home. But over the last year, I’ve gotten lazy. Sometimes I just don’t have the time to make the batter and let it cool in the fridge before dropping the dough balls onto the cookie sheet. Sometimes I just don’t want to take the time to make the cookies and wait for each tray to come out of the oven. So I started making bars. 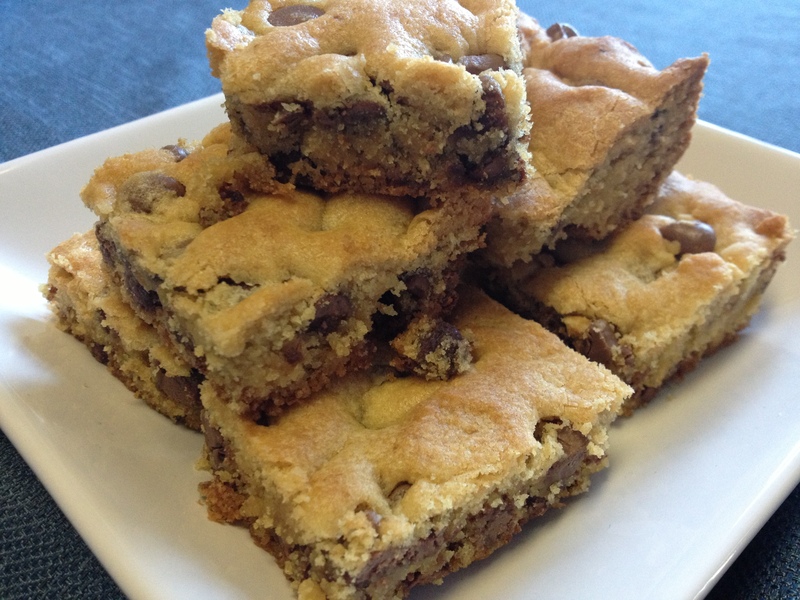 Oh, do I love making chocolate chip cookies bars. Same great taste with less of a hassle and less of a clean up. Twenty-two minutes, plus a few more for prep time and they are done. In a medium bowl, combine flour, baking soda and salt..set aside. In a large mixing bowl, beat together butter, sugars, vanilla, and pudding mix. Beat until smooth and creamy. Beat in eggs. Add flour mixture. Stir in chocolate chips. Spread batter evenly in a greased 9×13 baking dish. Bake for 22 minutes at 375 degrees, or until inserted toothpick comes out clean. This entry was posted in Recipes and tagged chocolate chip cookie bars, chocolate chips cookies. Bookmark the permalink.